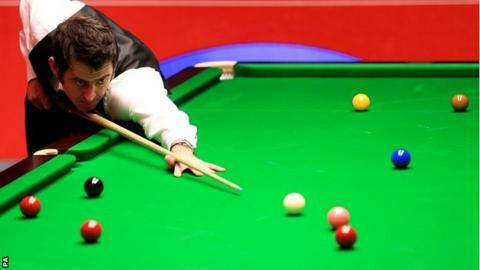 Ronnie O'Sullivan progressed to the World Snooker Championship second round with a 10-4 victory over Robin Hull. The Englishman, seeking a sixth world title and third in a row, dominated the morning session 7-2 before fending off a brief Hull revival in the evening. Finland's world number 122 closed the gap to 8-4 after a missing a frame-winning easy red in the 10th, but O'Sullivan won the next two frames. The top seed will play Joe Perry or Jamie Burnett in the next round. World number six Stuart Bingham took a 5-4 advantage over 1997 champion Ken Doherty on the opening morning at the Crucible Theatre in Sheffield, with play to resume at 10:00 BST on Sunday. In the afternoon session, Jamie Cope came from 4-2 down to lead 2005 world champion Shaun Murphy 5-4, while Welshman Ryan Day leads Scotland's Stephen Maguire 6-3, with both pairs to return to the table at 19:00 on Sunday. In Saturday's other evening match, Ali Carter, losing finalist to O'Sullivan in 2008 and 2012, took a 5-4 lead over China's world number 25 Xiao Guodong, who is making his first World Championship appearance. Play resumes at 14:30 on Sunday. O'Sullivan made a 124 break as early as the second frame as he won the first three against Hull, the lowest-ranked player in the competition, adding 69, 81, 60 and 90 before the close of a one-sided morning session. Hull raised his game as play resumed but O'Sullivan was ultimately comfortable if unspectacular in despatching an opponent who was making only his second appearance at the tournament and first since 2002. "I'm just pleased to have got through," O'Sullivan said. "I don't really see there's a massive expectation on me," he added. "I'm just here to do a job and I go about it as professionally as I can. There's one out of the way and I just move on to the next."